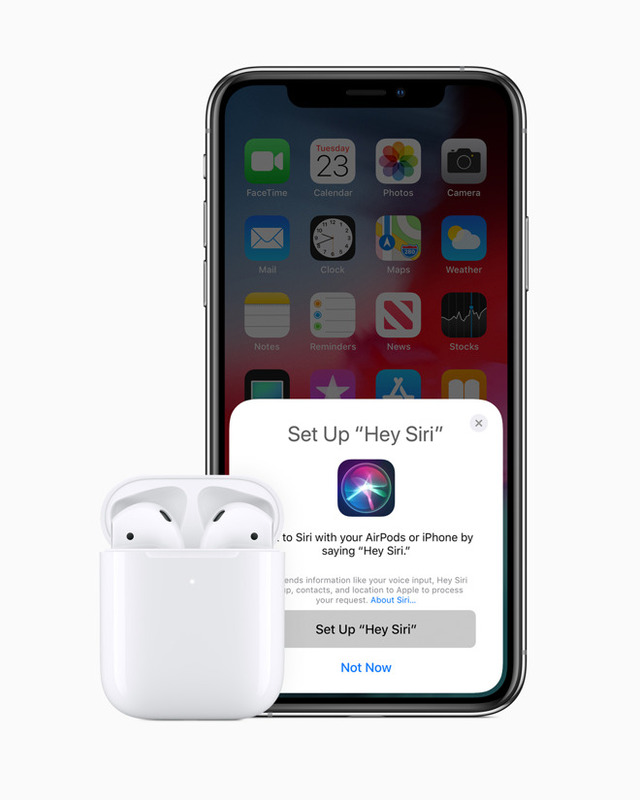 Adding to a full week of Apple releases, the company has refreshed the AirPods with a new wireless sync chip that allows for "Hey Siri," and longer battery life —and the arrival of the Wireless Charging Case. The new Apple-designed H1 chip, developed specifically for headphones, delivers performance efficiencies, faster connect times, more talk time and the convenience of hands-free "Hey Siri." Apple says that the new Apple-designed H1 chip features "custom audio architecture to create a revolutionary audio experience and improved synchronization." In the latest version, the wireless connection is said to be up to twice as fast when switching between devices, a third quicker at connecting for phone calls, and offers up to 30 percent lower latency when used in games. A combination of optical sensors and motion accelerometers are used to control how the AirPods work, including which microphones to engage for calls and Siri, and to play sound as soon as they are in proximity to the user's ears. This also enables a user to wear one AirPod for a call, with the other kept silent when not in use and not worn. Apple's second iteration of AirPods has up to 50 percent more talk time compared to first generation AirPods, according to Apple. The new AirPods come with either the standard charging case or the new Wireless Charging Case. Each case holds additional charges for more than 24 hours of total listening time. AirPods with standard charging case will be available for $159. AirPods with Wireless Charging Case will be available for $199. The Wireless Charging Case can be purchased by itself for for $79. Orders start on Wednesday, with delivery sometime the week of March 26. The arrival of the second-generation AirPods continues a hardware-heavy week of releases for Apple. On Monday it introduced the 10.5-inch iPad Air and the fifth-generation iPad mini, while Tuesday saw a refresh of the iMac range with new GPU options, at the same time as cutting prices for high-end SSD upgrades for the MacBook Pro, MacBook Air, and Mac mini. More new hardware could still be on the way, such as the long-awaited AirPower charging mat which recently surfaced in code references in the latest iOS 12.2 developer beta. Update: Shipment times for Apple's new AirPods slipped to April mere hours after the device was put up for sale. Shoppers can pre-order the new AirPods from Apple authorized reseller Adorama, however, with no sales tax collected on orders shipped outside New York and New Jersey.